Grandstream has always been providing its customers with efficient business and enterprise solutions. In that regard, Grandstream has brought its expansion module Grandstream GXP2200 EXT in the market so that the office communication can be further simplified. You can connect up to 4 expansion modules of GXP2200 EXT to these phones that will give you up to 160 extensions/contacts. Grandstream GXP2200 EXT module can prove to be a very convenient and affordable solution to the busy enterprises. It can be helpful in managing the high call volumes for different users that could either be the offices or receptionist. The telephone attendant will be able to monitor and dispatch multiple incoming calls efficiently via Grandstream GXP2200 EXT and in this way ensure maximum office productivity. Grandstream GXP2200 is a state of the art multipurpose attendant console for its supported handsets. The features of this expansion module are just amazing and present a perfect solution for the busy enterprises, solving their difficulties and providing them with a simpler way to manage and handle the incoming calls. The extension module features the appearance of 20 lines by default. When you use the switching page keys, then 20 more lines can be added. This is the same process like you turn your pages in the contact book. Thus, a maximum of 40 lines can be supported by the Grandstream GXP2200 EXT module where simultaneously, 20 lines can appear at a time. It is compatible with GXP2140, GXP2200, and GXV3240. A total of 4 Grandstream GXP2200 EXT modules can be daisy- chained off the phone providing you with 160 buttons. They are daisy chained with the power supply and can be controlled via base phone. It supports BLF (Busy Lamp Field). You may program the lines to either forward the calls or transfer them. You can program the lines to the conference and even for speed dialling to call to a line. For the power users, Grandstream GXP2200 EXT provides real-time The power users may be the busy enterprise executives or maybe the professional receptionists and telephone administrators. Upon buying the Grandstream GXP2200 EXT module package, the following contents will come along with it. Grandstream has gained the fame that it always deserved. With some resellers in many different areas of the world, Grandstream surely looks to grow rapidly and profitably. There is a huge demand for Grandstream products, and that is simply because of the expertise and quality of Grandstream. The award-winning designer Grandstream has always provided its customers with high quality and affordable audio quality and has always introduced its high-tech products to simplify the complex communication channels. Despite offering numerous advantages and features, the Grandstream GXP2200 EXT only consumes 1.2 W power per expansion unit. Thus, it proves to be more feasible and attractive to the customers, and the customers surely demand it and want to deploy it in their offices. There are countless resellers of Grandstream in Dubai that can offer you the Grandstream GXP2200 EXT Dubai module. You can check out their stores, shops or you may also search for the nearby authorized reseller of Grandstream on the internet and get to him to get your desired product. You will surely find a nearby store as the Grandstream products are easily available, especially in Dubai and also the other parts of U.A.E like Sharjah, Al Ain, Abu Dhabi, Ras Al Khaimah, Ajman and many others. So, go and get your Grandstream product now! 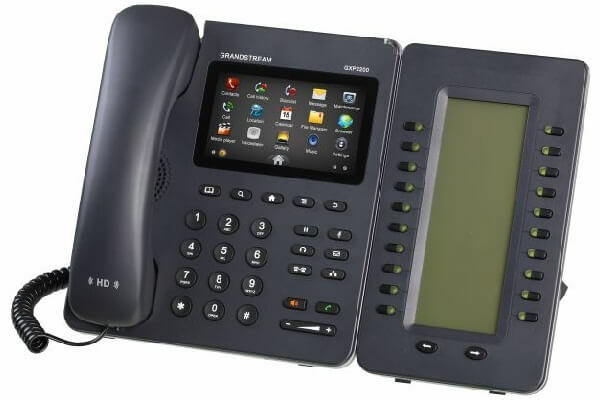 There is no doubt on quality and user friendliness of Grandstream GXP2200 EXT IP Phone. Mostly, users have provided positive feedback for GXP2200 EXT that give you a good idea about the quality and reliability of the product.There are a lot of GXP2200 EXT users in different areas of U.A.E. The positive feedback will surely help in making a decision buying this phone. Overall as far as the features are concerned, the phone seems to be a pretty good package!.Grandstream Dubai is always committed to provide you high quality IP Telephones.